Back in March at a press conference for his ‘One Of A Kind’ promotional tour, G-Dragon created media buzz for his controversial response to a question asking how he’s changed over the past four years. Four years ago, upon the release of debut solo album ‘Heartbreaker’, G-Dragon considered himself an idol – someone with ‘cute, adorable and varied looks’ who still had a lot to learn. Fast-forward to 2013 and he’s very much an artist, putting more thought into the creative process in hopes of reinventing K-Pop as a whole. It’s with this in mind that the title for his second full-length effort ‘Coup D’etat’ is fitting. Pairing a wide variety of genres with a cynical undertone, G-Dragon puts the limitations of Hallyu under a punk sense of scrutiny. And with a list of guest collaborators that reads as something of a ‘Who’s Who’ in rising talent, ‘Coup D’etat’ will easily be the album that takes G-Dragon from a Korean idol to a global music star. “COUP D’ETAT”: ‘Coup D’etat’ opens up with the greatly anticipated title track of the same name, a thickly layered trap-and-bass created in collaboration with Mad Decent producers Diplo (MIA’s “Paper Planes”, GD&TOP’s “Knockout”) and Baauer (“Harlem Shake”). The overall low-tempo creates a stark and declarative contrast to the steady stream of party anthems GD started with “Crayon” and “One Of A Kind”. While it didn’t fare as well on live music charts as other tracks on ‘Coup D’etat, Pt. 1’, it is by far the most important track in that section of the album. 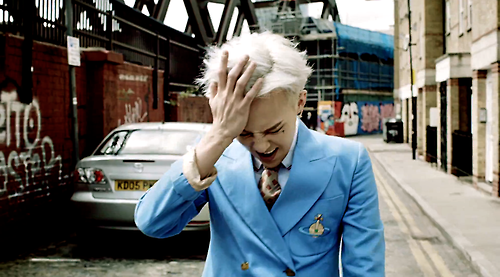 It’s a song that takes G-Dragon out of his safety zone as an idol and projects him directly into artistry. Is it a good K-Pop song? No, not really. But GD seems to have never considered it to be one. Classify it as a bold EDM track, and it introduces the audience to something a bit more challenging and outside of the box. It catches attention and allows the listener to take it from there. “R.O.D” featuring Lydia Paek: Lydia Paek is no new name to YG Entertainment superfans. She’s written songs for a number of artists on the label’s current roster and is responsible in part for hits like 2NE1’s “I Love You” and Lee Hi’s “1 2 3 4”. Her YouTube channel showcases a wide array of vocal and dance covers, her adaptability as both a singer and dancer creating much fan hype for her own debut. While production on her own EP is indefinite, “R.O.D” is the first time Lydia steps into the YG focus as a recording artist, laying down the song’s chorus with almost a dancehall feel despite its choppy dubstep influence. The track also shows a huge growth in the style of YG staple producer Teddy, the stripped down, contemporizing bridge bringing ‘R.O.D’ a sense of hip-hop maturity reminiscent of Kanye West’s “My Beautiful Dark Twisted Fantasy”. “BLACK” featuring Jennie Kim (KOR.) / featuring Sky Ferreira (ENG. ): “Black” stands alone as the album’s only true ballad and showcases the talents of up-and-coming YG trainee Jennie Kim and American indie-pop girl du jour Sky Ferreira in the Korean and English versions, respectively. The two collaborators have two distinctive ways of singing, giving the song almost an entirely different feel depending on which version you’re listening to. Sky’s breathy delivery brings angst to a song that is already somber in nature, while Jennie’s voice provides a layer of vulnerability throughout. While having Sky work with G-Dragon may be toward his image’s advantage, it seems like almost a waste of a collaborator. However, Jennie’s work on “Black” is not only sufficient but brilliant – perhaps enough to even gain her substantial recognition even before her official debut. “WHO YOU”: “Who You” tells the story of an ex-girlfriend who’s moved on and seems almost thrown in to reassure fans that have been skeptical throughout the album thus far that the ‘old G-Dragon’ is still alive. The poppy synthesizer played throughout matched with the ‘do-do-do’ of the chorus is much more Bruno Mars than it is the ‘MC-eating PacMan’ we found boasting his way through the first few tracks. The aggressive attack of his delivery slows down and softens up, making it sort of a strange fit when paired with the rest of the album, though still a fun and enjoyable track. “MICHIGO”: Originally released as a promotional single for global messenger app LINE, I wasn’t immediately sold on “MichiGO”. Everything sounded like I had heard it before in “Crayon” – that same ‘hip-hop meets house’ party track now turning into a formula helping both G-Dragon and YG Entertainment make a whole bunch of endorsement money. However, within the context of ‘Coup D’etat’, the song goes from being someone else’s commercial to being a part of GD’s attack. It flows in nicely after “Shake The World” to further solidify that glitchy, futuristic sound that’s evolving. Do I think it’s his most original track? No, but it’s really awesome to bump in my car. “CROOKED”: Upon first listen, “Crooked” reminded me a lot of BIGBANG’s “Oh My Friend” collaboration with Korean rock outfit No Brain. But both lyrically and musically, the song seems to want to rouse up the same in-your-face rebellion found in “Coup D’etat”. (Is there any wonder why these both became the promoted singles?) I love the ‘Anarchy in the UK’ style of the music video, a continuation on the theme of doing away with the politics of constrained image and sound. The song has shown to be wildly successful both in Korea and internationally – proof that despite all of this artistic overhaul, G-Dragon can still write a hook. “RUNAWAY”/“I LOVE IT” featuring Zion.T: “Runaway” seems like something of a throw-away track, similar to “What Do You Want?” from the GD&Top album. It just doesn’t fit with the rest of the album. “I Love It” is only slightly better, the way the song builds into full-out cowbell-laden disco track enough to keep the listener from being entirely bored throughout. As a big fan of both Zion.T and German electro-house producer Boys Noize (who also worked with BIGBANG on Alive track “Feeling”), I expected a lot more from “I Love It”, but perhaps knowing what both are capable of when as their best is what so easily let me down. “YOU DO (OUTRO)”: This song has quickly become my iTunes’ sleeper hit. The very basic hook and stripped down production still remaining very ‘hip-hop’ gives the end of the album a very early 00s Neptunes sound. It’s no wonder that upon releasing the album in full, Neptunes’ own Pharrell Williams is on Twitter begging GD for collaboration. But if anything, just the fact that ‘Coup D’etat’ has made him a blip on someone like Pharrell Williams’ radar is putting him in a prime location. If ‘Coup D’etat’ is nothing more than a catalyst for breaking out of the ‘aegyo hip-hop’ image K-Pop is known for and being taken more seriously, G-Dragon is well on his way. Will he pull it off? Time only knows. But the buzz he’s created doesn’t seem to be dying down soon. Next “Let Me Out” plays Sept. 25. Buy your tickets by the 18th!! !